​Sonamarg means a 'meadow of gold'. The most important township in the fertile Sind valley, Sonamarg is the last major township in Kashmir on the road to Ladakh. 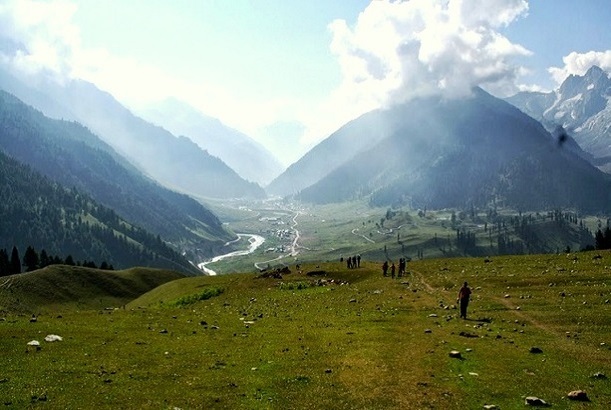 Sonamarg is also the staging point for some of the most popular treks in the higher altitudes. The most popular short trek originating from Sonamarg is the Kashmir Short Trek. It covers the lakes of, Vishansar Lake and Kishansar Lake. Day Details Today will be first day of this enthralling Kashmir short trek! After having breakfast at the guesthouse, start with a 3-4 km trek from the Sonamarg and reach a roadside eatery, from where you can bag up all the required commodities for the day. Here onwards, the trek will be a gradual one and alongside the Sindh River, it will take you through maple and pine forests. Completing the hike through the forests, you will be rewarded with the stunning views of the Sonamarg Valley and pictorial streams. Day Details Starting early in the morning; around 08:00 AM, start the trek towards the Nichnai Pass and enjoy the stunning views of the lush valleys and the untouched beauty of the region. Hereafter, cross the river and continue hiking through the banks of the river and arrive at the Nichnai Pass or the Vishansar Berry. Arriving at the pass, which is located 12,767 ft above the sea level, witness and enjoy the meticulous beauty of the pass and the snow-covered peaks all around it. Day Details This day of the Lakes in Kashmir Trek would be a light one as you acclimatize yourself to the weather and rest at Vishansar and visit to Krishansar Lake; overnight stay in the camp. Day Details On your final day of the Kashmir Short Trek, start from the Vishansar camp, ramble on grassy land dotted with yellow flowers and pine forest. Descend and reach Sonamarg, the last leg of your trek. Reach Sonamarg Village in Ganderbal District. Be driven back to Srinagar and unwind in guest house for the night. Normally we expect to carry your personal luggage on your own, if you don’t want to carry your backpack so you can give it to porter, but you have to inform us in advance and have to pay Rs. 300/- extra per day per bag. The cost of transport from Srinagar to Sonamarg and return from Sonamarg to Srinagar has to be borne by the participant. We have arrangements for transport to pick up trekkers from Srinagar at extra cost. The vehicles will leave Srinagar at 8.00 am and reach Sonamarg by 11.00 am. The stay at Srinagar on the last day is not included in the trek fee. However we can assist you in booking a hotel or a houseboat for the same. Most participants opt for Kashmir Tekking pick up - and we assume the same in your case. In case you do not want the pick up, please let us know at least 15 days in advance to the start of the trek.